Crunch! Yum! Delicious! That was my first bite into my very first taco at, The La Cabana Restaurant in Anchorage, Alaska. Then, a second bite into my crunchy taco along with eating the yummy rice and tasty beans in my very first, La Cabana combo meal. As I looked up from my plate I could see my mother Feodoria, step-father Bob and my sister and brothers enjoying their first combo meal just like me. We lived on 2nd Ave and Cordova in Anchorage, Alaska in the 1950's. As I recall, our family had not eaten at the La Canana until 1962. We had walked by it on our way home from school but never stopped in. However, this was a special occasion and this was where my mother wanted to take us. Wow, were we glad she did. The meal was delicious and their Coca Cola fountain drink was especially tasty and refreshing. The La Cabana is Alaska's Original Mexican Restaurant built in 1953. This restaurant by far out tastes any other Mexican restaurant that I've eaten at..even here in sunny California. That does it. Now I've gotta go get a taco combo meal down the street. It won't taste like The La Cabana's but a craving is a craving! Check out Wishing for a Lucky Wishbone Lunch right now. 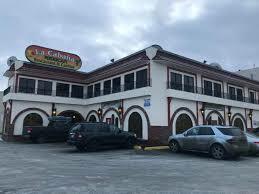 The very first Mexican restaurant I ever ate at was the La Cabana in Anchorage. My mom and dad took us there for dinner one night. When we got in the car to drive to the restaurant, I asked mom and dad what Mexican food tastes like. Back then, the La Cabana was actually in a log cabin near downtown. I remember walking in and the first time that wonderful aroma filled my senses. Years later, when I started working at KTVA channel 11, they were still located in what was then called "the McKinley building". And the La Cabana was just down the street. I was so excited because I was close enough to the La Cabana to enjoy dinner there a couple of times a week. Join in and write your own page! It's easy to do. How? Simply click here to return to Anchorage Alaska Restaurant Stories.